“A Cajun gastrique?” you ask, as well you might. I did, when I had something similar at Grille 26 in Sioux Falls. Yep, I stole yet another idea from yet another Minerva’s related restaurant in Sioux Falls. The first was the Taphouse 41 Salad, the second was the Tomato Zucchini Bisque. And now this. While this dish isn’t exactly like Grille 26’s, this idea of theirs, a Cajun Gastrique, is inspired. 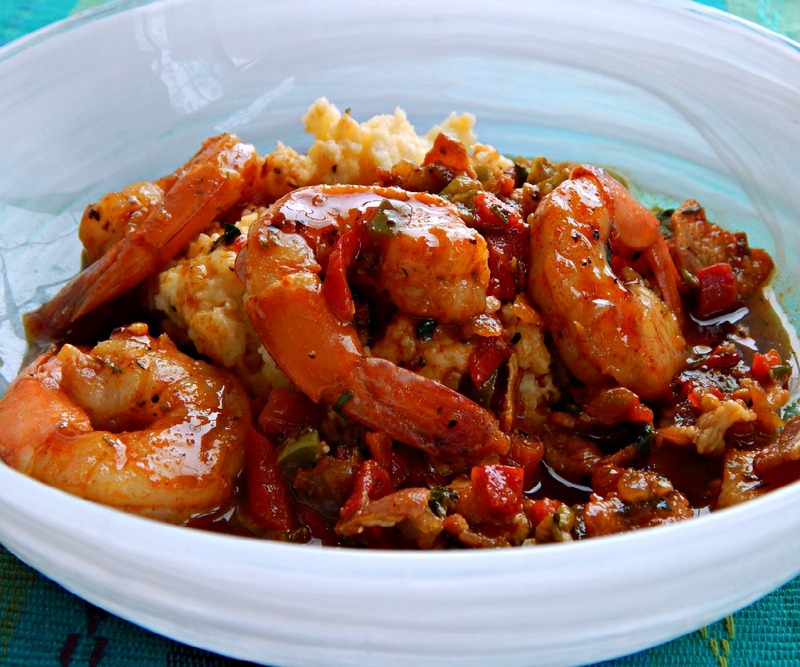 The Gastrique is a sweet, salty, spicy blend of caramelized sugar, vinegar, and spices and drizzled around the Shrimp and Grits lends a flavor boost that’s out of this world. I’m from the North, so I used bacon in my Shrimp and Grits – Andouille would be a great addition if it’s available in your area. If not, don’t stress because it’s fantastic just as it is. Frankly, though, if you decide not to use the gastrique (do use it, though, lol!) you’ll love this Shrimp and Grits, too. Of course, if you’re making Shrimp & Grits, you’ve got to serve Grits (recipe to follow) and I followed the lead of Grille 26 and choose Cheesy Grits. The Grill used Tasso, too, and they were wonderful, but any grits are going to be the perfect foil the spicy sauce. Place a 12-inch sauté pan over medium-high heat, and add the bacon. Saute until golden brown. Remove bacon and reserve. Remove all but a tablespoon or two of the drippings and set the excess aside. Sprinkle the shrimp with a healthy tablespoon of the spice blend. Saute in the oil until just done, two to three minutes. Remove and set aside. If necessary, add a little of the reserved drippings to the pan. Add the onion and peppers, cooking until nearly soft. Add the garlic and the white portions of the green onion, saute a moment more. Add the remaining Cajun Spice to the pan, stirring briefly, then add the stock and bring to a boil. Reduce to a simmer and cook until the stock has reduced by about half. Return the bacon and shrimp to the pan, heat through. Remove from heat and garnish with the green portions of the green onion and the parsley. Serve over grits, drizzle the Cajun gastrique around the dish. Garnish with lemon. Notes: for a more traditional Shrimp and Grits, 1/2 cup of cream can be added after the reduction. Read Strategies Applied, below, for additional tips as well as throughout the recipe, for saving money/time and managing this recipe. The pricey ingredients in this recipe are obviously, the Shrimp and the Bacon. When I buy shrimp, since I live in the Midwest, it’s almost always frozen. In stores, unless it’s flown in fresh, it’s been frozen and thawed. Look for Shrimp on sale, especially around Holidays, and check Aldi. I find that the frozen shrimp that has the best texture is in the shell, and I thaw it overnight in the fridge on several layers of paper towel. Bacon freezes very well. I buy it on sale and with a coupon, if possible and chuck it in my freezer. There’s no reason to pay full price for it. Simply, with a very sharp knife, cut the frozen bacon. This entry was posted in Click here for Bargain Meals, Click here for Fabulous Food Posts and tagged Bargain Meal of the Week, Bell Peppers, Cajun & Creole, Frugal Hausfrau, Grits, mardi gras, new orleans, Shrimp. Bookmark the permalink. Wow! What a feast you have prepared again! Thanks, Ginger – it was great timing; the start of Lent is a big celebration in New Orleans, where this dish originated, and it was a lovely special dish for Valentine’s Day, too. I love shrimp and this recipe looks amazing! Thanks, Julie! This is going on our frequent rotation list! I’m sure these are just fabulous!!!! They looks so very tasty and spicy, which is just the way I like it! I LOVE love LOVE shrimp and grits! This sounds wonderful. Shrimp and grits are on my bucket list of things to make. I’ve never tried them and don’t know anywhere that makes them in my neck of the woods. I don’t know why I keep putting it off. I’ll pin this recipe for when I finally decide to make the leap! Carlee, they go really fast once you start cooking them! I used to be a pretty big snob about frozen fish/seafood and that held me back a bit. I think the quality on frozen food is so much better than it used to be and frankly, here, I trust it a lot more than what’s in the fish case! Thanks! I wish there were some left, lol!